We have stepped into the knockout stages of the World Cup and have already found the first set of quarterfinalists. As the temperature continues to rise, we take a look how things are going with the boots, at this historically enthralling World Cup. There are many interesting boot spots on display and we have found the picks of the bunch. Come along. 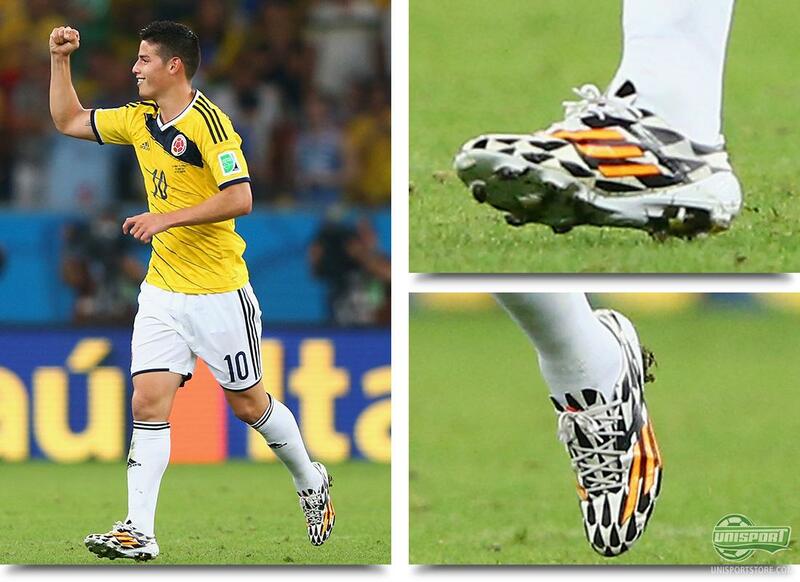 adidas F50 Adizero – 42 Goals James Rodriguez (Colombia) – F50 Adizero Battle Pack We continue to follow our football boot top scorers list, as the tournament progresses. Alone on the top of the pile is the F50 Adizero, which continues to roll on. There is however a new boy in town, at the top of the players top scorers list. James Rodriguez has already had an impressive World Cup and with his two goals in the 1/16 finals against Uruguay, he cemented the fact that it was much more than beginners luck. He has come to stay and his F50 Adizero boots have really been doing the business for him, with 5 goals – the one better than the other. 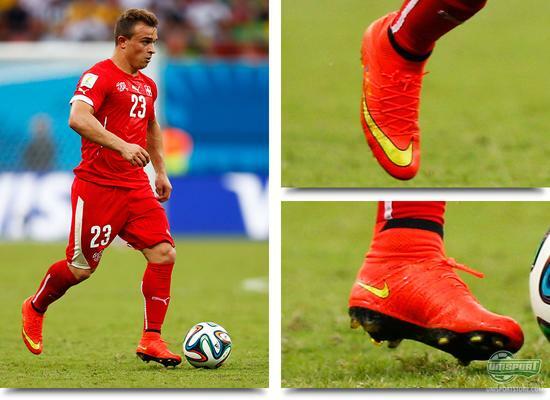 Nike Mercurial Superfly – 21 Goals Xherdan Shaqiri (Switzerland) – Nike Mercurial Superfly Hyper Punch/Gold/Black It has been an emotional rollercoaster for Switzerland at the World Cup, with both highs and lows. Their 3-0 rout against Honduras definitely counts as a high point and with it securing their progression from the group stages, the Swizz hope to push on from here. Paramount to their success has been the young Shaqiri, who really announced himself at the World Cup, with his first hattrick. The Superfly has now scored 21 goals in Brazil, so it’s going to take some doing, before it reaches the F50 Adizero, who has scored twice that amount. 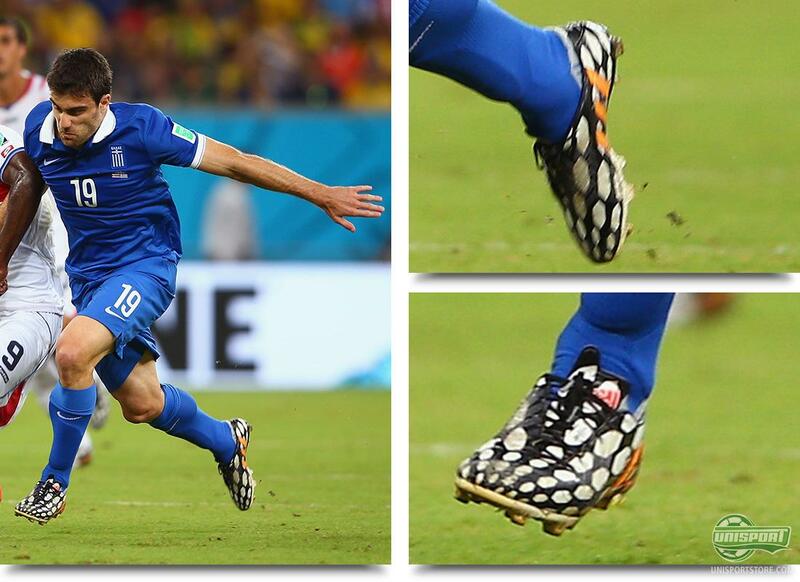 adidas Predator – 16 goals Sokratis Papastathopoulos (Grækenland) – adidas Predator Instinct Battle Pack The Predator Instinct can be found on the feet of some of the world’s largest technicians. It has however been the less profiled players, who have really shown off the boot in Brazil. In yesterday’s game between Costa Rica and Greece it was the Instinct that was responsible for both goals and particularly Sokratis’ last minute equaliser will be remembered, as it almost secured them progression in the tournament. Unfortunately for Greece and Sokratis, Costa Rica had the nerves during the penalty shoot-out. 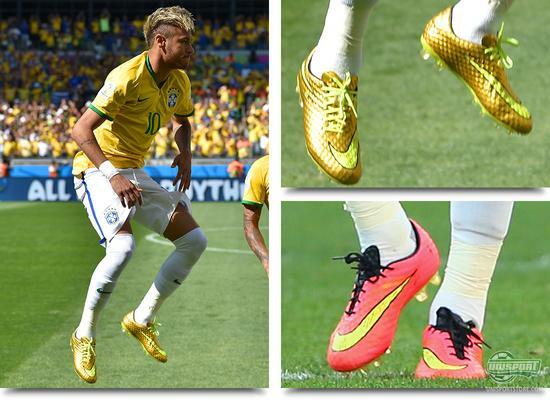 Nike Hypervenom – 15 Goals Neymar Jr. (Brazil) – Nike Hypervenom Phantom Gold + Bright Crimson/Volt/Black Neymar Jr. does get huge amounts of attention at this World Cup, but the Brazilian prodigy does also play a very central role this year. This was especially the case in this was the game, as he was set to play in the gold Hypervenom boots that were inspired by his childhood dream of gold boots. Neymar did start the game in them, but changed at half time, back to the boots that have so far scored 4 goals. They were therefore the boots he scored his penalty in, so a good choice in the end. Maybe the gold blinded him just a little too much? Nike Mercurial Vapor X – 10 Goals Guillermo Ochoa (Mexico) – Nike Mercurial Vapor X Bright Crimson/Volt/Black There is always lots of focus on the outfield players, especially the ones wearing Nike’s Lightweight boots. 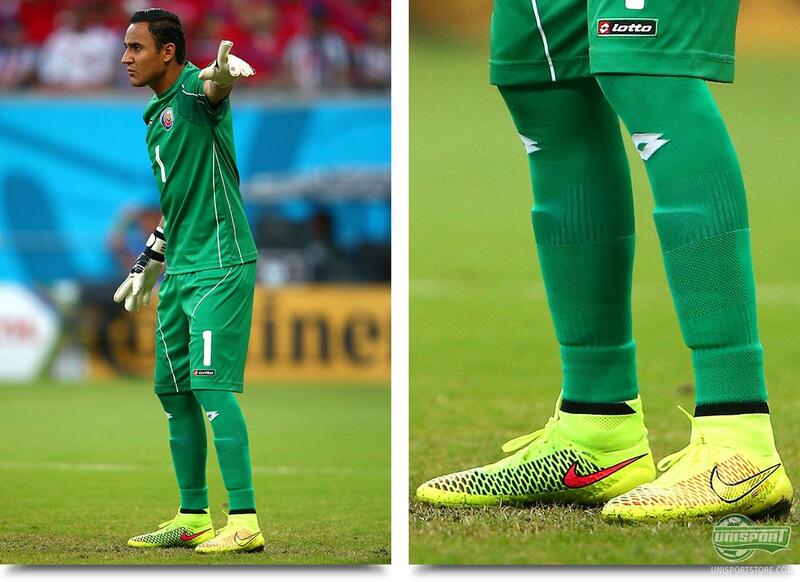 There is however quite a large handful of goalkeepers, who also use the Mercurial Vapor X as their weapon of choice. Among them is one of the World Cup favourites so far, Guillermo Ochoa, who has had a very strong showing at this year’s World Cup. Unfortunately for Ochoa they didn’t make it past the Dutch and the question is, if his 4 four games can get him the Golden Glove? Nike Magista Obra – 8 Goals Keylor Navas (Costa Rica) – Nike Magista Obra Volt/Metallic Gold Coin/Black The Magista Obra boot is a football boot made for the creative playmaker. This does however not exclude others from enjoying its undisputable qualities. Among them is Costa Rica’s goalkeepers Keylor Navas, who has played a central role in the small South American nations trailblazing World cup. Navas’ save in the penalty shoot-out meant that they could, for a little while longer, continue their conquest. 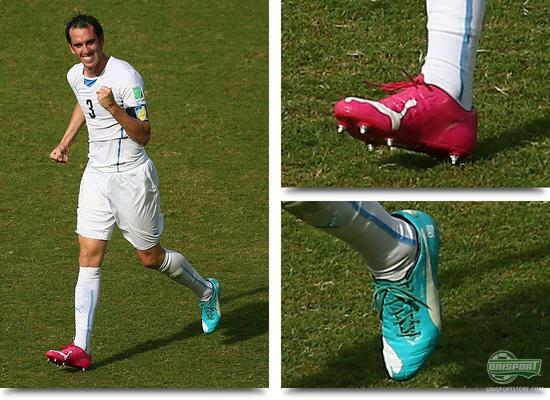 Puma evoPOWER 1 – 6 Goals Diego Godin (Uruguay) – Puma evoPOWER Tricks Before Uruguay this Saturday were knocked out by Colombia, hopes were high in the country, with the World Cups smallest population. This hope was definitely lit by Diego Godin, who scored the winner against Italy, sending them through to the knockout stages. Godin has had a stunning season, with more than convincing defending and several goals in big games. Him and his evoPOWER boots were however overpowered by Colombia, with James Rodriguez showing levels of football that only very few possess. Nike Magista Opus – 2 Goals Giovani Dos Santos (Mexico) – Nike Magista Opus Volt/Metallic Gold Coin/Black Had a football game only lasted the 90 minutes, Dos Santos would have as a minimum secured extra time. Dos Santos could finally see his name on the score sheet, after several great performances and bring some spotlight on his Magista Opus boots. 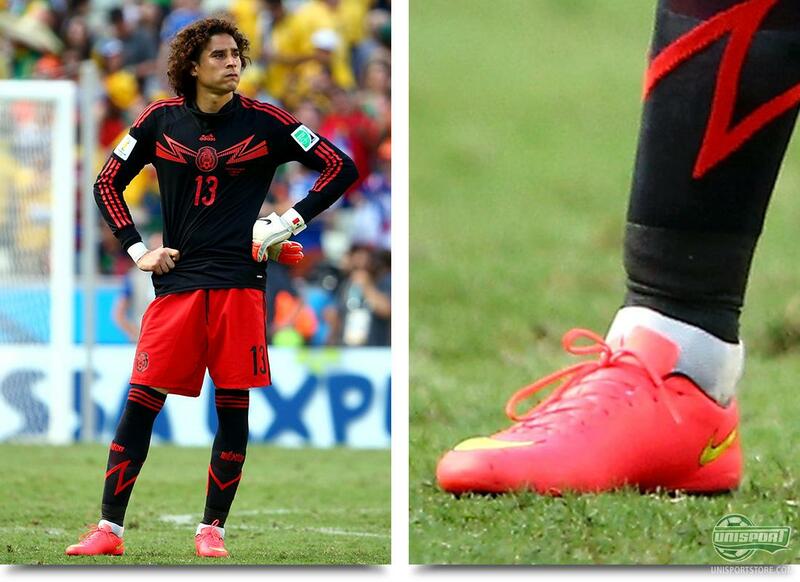 They are a fantastic alternative to the Magista Obra, as they are a boot very much in their own right. 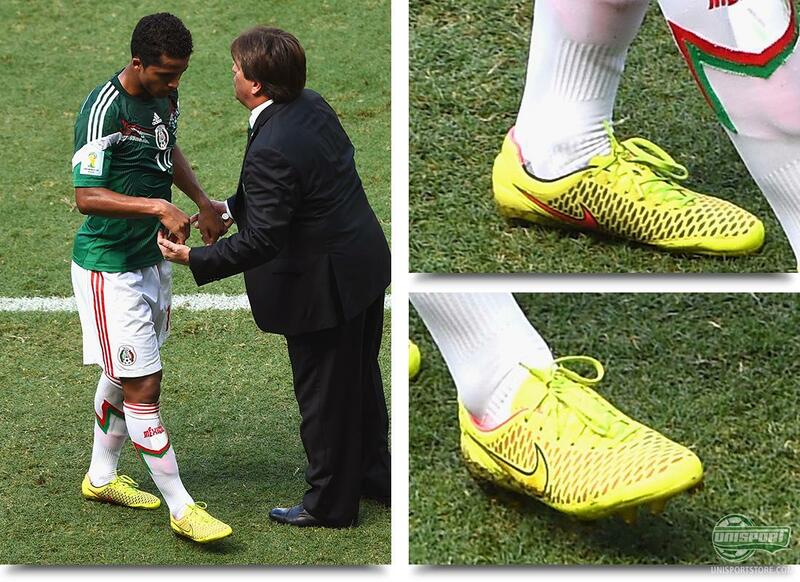 Unfortunately for Dos Santos he won’t get the chance to score anymore goals in his Opus boots, as Mexico went out to Holland. Mauricio Pinilla (Chile) – Umbro Geoflare We round off this week’s boot spots with a couple of bonus spots. First off is Chile. He was substituted in the 87th minute, hit the crossbar in the 120th minute and missed Chile’s first penalty. 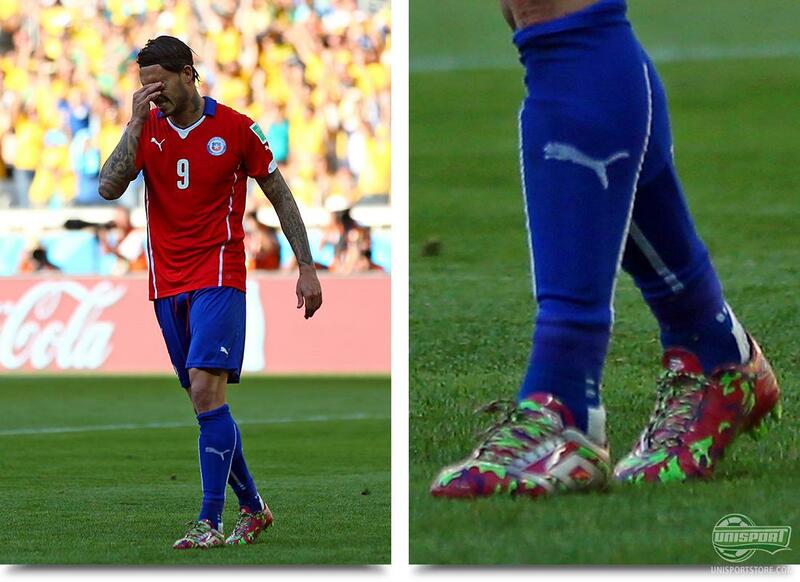 Quite an emotional evening for Mauricio Pinilla. Pinilla is one of the only players to wear Umbro boots at this year’s World Cup and he did so in the quite cool GeoFlare boot. 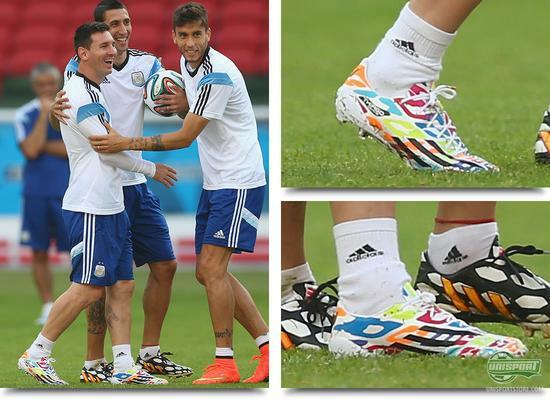 Lionel Messi (Argentina) – adidas F50 Adizero Battle Pack Messi Edition Celebrating your birthday in Brazil can’t be half bad and when you then get a pair of exclusive F50 Adizero from adidas, what could be better? This was exactly what Messi got to enjoy on his 27th birthday, as adidas honoured him with a very special boot, with only 27 pairs around the world. Messi was back in his regular Battle Pack boots in the game against Nigeria, which proved a very good choice, as he knocked in two goals.